The purpose of this guideline is to provide information for workers and students regarding the safe storage of chemicals in accordance with AS/NZ 2243.10:2004 Safety in Laboratories - Storage of Chemicals and the Queensland Work Health and Safety Act 2011. This guideline applies to all UQ workers and students who need to store chemicals. All organisational units have a responsibility to ensure that hazardous substances, including chemicals, are correctly stored and labelled. This guideline will aid UQ staff and students to understand their obligations and to apply the recommended protocols. This guideline should be be read in conjunction with other related sections of PPL 2.70 Occupational Hygiene and Chemical Safety. The quantities of hazardous chemicals should be kept to a minimum, commensurate with their usage and shelf life. Regularly review the chemicals held in storage and correctly dispose of those no longer required using the UQ waste procedures found on the OHS Division website: Chemical Waste Disposal. Chemicals must be stored compatibly with one another. Refer to the Workplace Health and Safety Queensland DEIR Segregation tool for dangerous goods for further information. Further clarification if required can be obtained from an Occupational Hygiene Advisor or the Workplace Health and Safety Coordinator in your area. All packages in storage should be clearly labelled to to identify the contents. All labels should comply with the relevant regulations for hazardous chemicals. See PPL 2.70.04 Chemical Labelling for more detailed information. Substances which are unstable at ambient temperature must be kept in a controlled temperature environment set to maintain an appropriate temperature range. Reliable alternative safety measures must be provided for situations when utilities such as power, fail. Substances that can present additional hazards on heating should be clearly identified. Sunlight can affect some plastic containers or the chemical contents. Containers or chemicals that can be affected should not be stored where they can be exposed to direct sunlight. Chemicals such as hypochlorite solution and NoChromix glassware cleaner decompose to produce gaseous products and must be stored in vented cap containers. Ensure a vented cap container is used if decanted from the original manufacturer packaging. Vented cap containers must be stored in an upright position, otherwise venting of gaseous products will not take place. AS/NZ 2243.10 – Safety in Laboratories: Storage of Chemicals, states the following quantities of chemicals are permitted to be stored in a laboratory, other than in a chemical storage cabinet (i.e. open bench storage). These limits should be followed as closely as possible, and quantities in excess of these levels should be stored in a dedicated storage cabinet. Shelves used for chemical storage should be restrained against lateral movement and must have lips on them to prevent containers being pushed through to the other side. 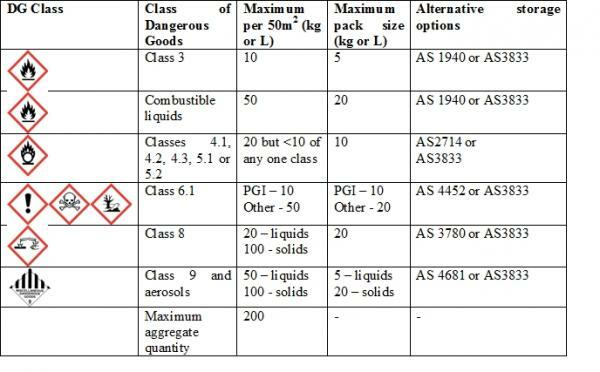 Chemical storage cabinets for the storage of dangerous goods are required where the storage quantities exceed those listed in the table above. The cabinets should comply with the design requirements of AS1940-1995 or the design criteria in the relevant standard. Where possible, store chemicals on spill trays within cupboards or cabinet. materials that generate significant additional hazards by undergoing slow chemical reactions. It should be noted that time-sensitive chemicals can be pure reagents or they can be commercial mixtures formulated as cleaners, adhesives and other products. All time-sensitive chemicals should be immediately marked with an expiration date upon receipt and listed on the laboratory chemical inventory to ensure timely disposal. The Safety Data Sheet for the chemical will state whether it is unstable under certain conditions or after a period of time in storage, and this information should be highlighted in the risk assessment. Containers should be inspected periodically to verify their condition. Signs of peroxide formation include: crystal formation in the container, discoloration of liquids, or a “mossy” appearance around the cap. If suspect materials are recognized, do not handle the container. Particularly, do not attempt to remove the cap. If explosive crystals have formed around the cap, the friction created by the unscrewing of the cap may be enough to detonate the compounds. All chemical storage rooms must be purpose built and comply with the requirements of Section 5 of AS2243.10. 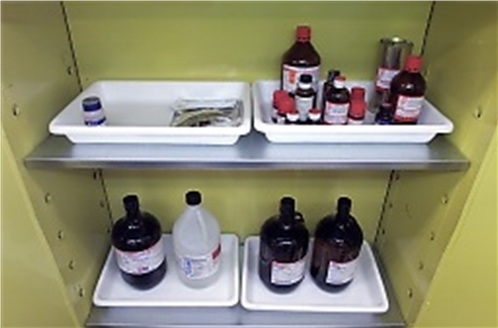 This standard allows for the storage of chemicals in quantities that exceed the quantities permitted to be kept on laboratory shelves or in chemical storage cabinets in the laboratory. New buildings will generally have a dedicated Hazardous Area Classification (HAC) assessment covering the storage of flammable liquids, which may also apply to general laboratory areas as well. The HAC should be consulted when deciding the type and quantity of flammable liquids to store within a building. Where flammable substances are to be stored in refrigerators, a pharmaceutical fridge or freezer with a spark proof interior must be purchased. Refer to PPL 2.70.07 Storage of Chemicals in Fridges, Freezers and Cold Rooms. AS/NZS 2243.10 - Safety in laboratories – Part 10: Storage of Chemicals. AS 4332 - The storage and handling of gases in cylinders. AS/NZS 1596 - LP gas - Storage and handling. AS 1894 - The Storage and handling of non-flammable cryogenic and refrigerated liquids. AS/NZS 2927 - The storage and handling of liquefied chlorine gas. AS 1940 - The storage and handling of flammable and combustible liquids. AS 4326 - The storage and handling of oxidising agents. 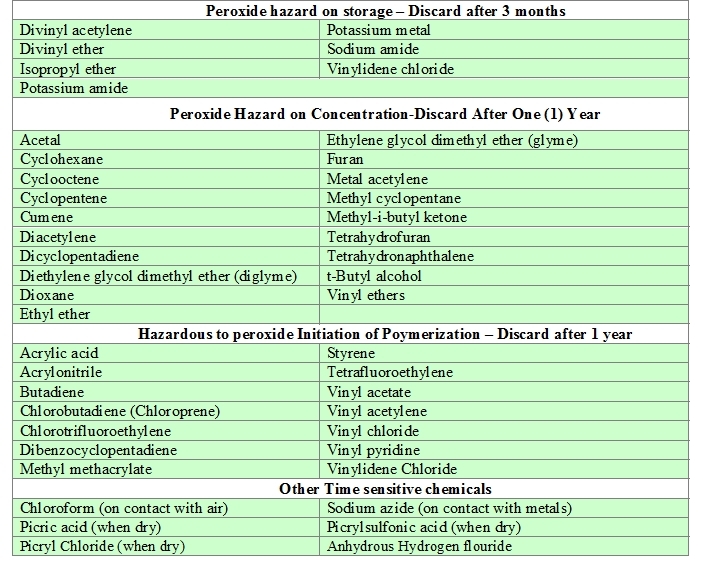 AS 2714 - Storage and handling of hazardous chemical materials – Class 5.2 substances. AS/NZS 4452 - The storage and handling of toxic substances. AS 2507 - The storage and handling of agricultural and veterinary chemicals. AS 3780 - The storage and handling of corrosive substances. AS/NZS 3833 - The storage and handling of mixed classes of dangerous goods in packages and intermediate bulk containers.